This chicken dish is both delicious and quick to cook. It is very popular with my children! I tend to add a small amount of curry at first, then serve the kids portions before adding more curry for hubby and myself. An alternative style is to add unsalted peanuts after the onions. 1/ Heat oil over medium heat. 2/ Add Chicken and stir until cooked. 3/ Add onion. Stir until it starts to look transparent. 4/ Keeping the cooking juices in the pan, spoon in around four heaped dessert spoons of peanut butter. 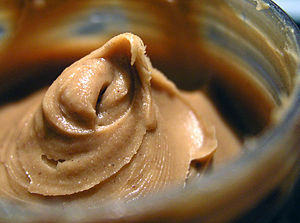 Stir until the peanut butter begins to melt. 5/ Add a little water and continue stirring. Add a little more peanut butter or water until it reaches the desired consistency (I like mine saucy but not too runny!). 6/ Add curry to taste and enough water to maintain desired consistency. 7/ Serve on a bed of rice.